This axiom that any camera without an eye-level viewfinder is a toy is false. There is a long history of cameras that are composed on the ground glass (http://en.wikipedia.org/wiki/Ground_glass). 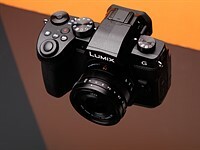 I would much rather have my NX200 than a Canon T3i which does not autofocus well when composing on the LCD. I'd much rather have a huge rear screen and no eye-level viewfinder than a mediocre (NEX) rear screen and a tiny, dim, or slow eye-level viewfinder. The exception would be be in the case that I am doing long telephoto work especially of moving subjects. But if I was doing that, I would probably buy a camera with a larger grip anyway - like a K-30, or a camera with a smaller format that uses light and small telephoto lenses such as Nikon 1. Different tools for different tasks. Long-term, I would rather invest in the system with high quality glass, large sensor, a stable and powerful electronics manufacturing company, and extend my photography work into telephoto in the future via digital zoom and in the present through the high quality if cumbersome 50-200mm which works great on a tripod; and by the way I'd rather use an AMOLED on a tripod than an OVF. That said, an add-on EVF might conceivably be tempting, depending on the price/quality.